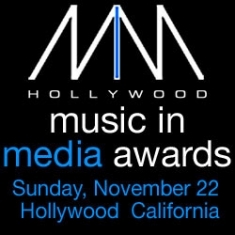 The Hollywood Music in Media Awards, the only red carpet style awards show in the world that includes a comprehensive interactive industry conference (MIMICON) designed to inform, educate, present opportunities and further the careers of its participants, recently announced its slate of 26 first round nominees and is currently accepting online submissions for its next round. Scheduled to be presented November 19, 2009 at The Highlands in the world famous Hollywood & Highland/Kodak Theatre complex in Hollywood, CA, this exciting new red carpet event (www.hmmawards.com) features live performances, award presentations, a VIP reception and banquet dinner catered by Wolfgang Puck™. Music artists and artist representatives can submit music for nomination consideration directly through the HMMA web site or through the event’s designated submission partners. All submission instructions are provided on the HMMA Submit Music Page. Participants can enter as many songs/videos as they wish (each no more than five minutes in length) There is a nominal fee for each submission. Industry and foundational entities can participate via sponsorship and/or strategic partnerships. Businesses and entrepreneurs wishing to participate can do so via the HMMA Sponsorship Program. The Hollywood Music in Media Awards (HMMA) recognizes and honors the music of visual mediums, the talented individuals responsible, and the music of independent artists from around the globe. Both mainstream and independent artists are honored as peers for their compositions and recordings in all forms of media including film, TV, video games, commercial advertisements, movie trailers and music videos. The HMMA is the first music awards event to recognize and honor excellence in music supervision and to place video games alongside TV and film in terms of importance. In addition, iconic individuals are presented with special awards for outstanding career achievement and longevity in entertainment; Recipients of HMMA’s 2009 Outstanding Career Achievement Honors include Rock and Roll Hall of Famer Dave Mason and film composer John Debney. The entire event will be shot with multiple HD cameras for digital and cable broadcasts in 17 countries and U.S. territories (120 Million households). In conjunction with the HMMA, the Music In Media Interactive Conference (MIMICON) will take place November 20-22 at the landmark Renaissance Hollywood Hotel. Currently accepting registrations, MIMICON will feature top industry luminaries focusing on what artists and entertainment professionals need to know to get their music in film, TV, video games, movie trailers, commercials and other forms of contemporary media. Artists, composers, producers and song-writers will be given the unique opportunity to pitch their work directly to the professionals that place and license music. MIMICON will include panels, seminars, workshops, interactive displays, live performances and one-on-one mentoring sessions with top industry professionals. Keynote speakers are scheduled for the luncheon gala, and renowned organizations such as The Guild of Music Supervisors will play key roles in all aspects of the conference. Early-bird registration is $295 through August 9th and full price registration is $495.